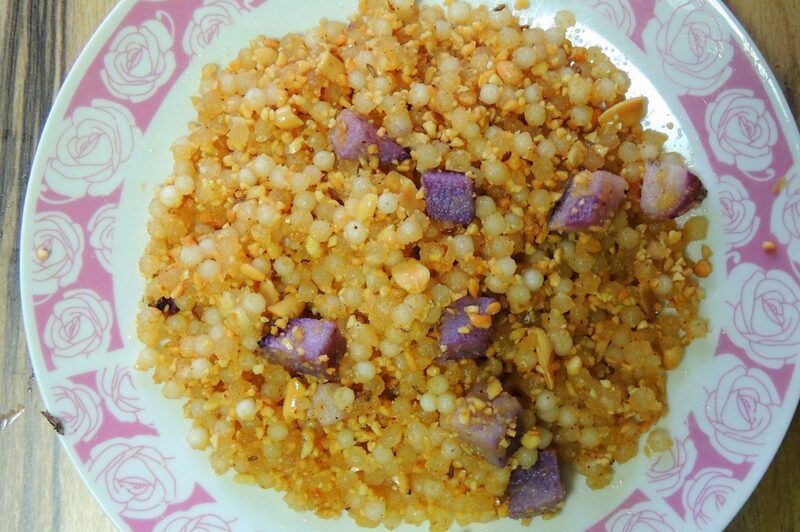 – 1) The main ingredient for this dish is of course Sev. This sev is easily available in stores. It is bit hard, hot and orange in colour. ( See the snap.) The softer and thinner versions should not be used, as they dissolve immediately, in this curry. You would need 2 cups full of this sev. – 10) Oil, as needed. – 13) Salt to taste. – 1) Dry roast the cumin seeds , coriander seeds and dry chilies ( if using chili powder, add after putting off the flame.) and grind to a fine powder. – 2) Roast the coconut till brown, keep aside. – 4) Grind together the coconut, onion, ginger and garlic. – 5) Mix the dry powder and garam masala to this paste. – 6) Heat some oil and add mustard seeds, asafoetida and turmeric. Then add this paste and fry till aromatic. Add the chopped coriander. – 7) Add water and salt and let it boil for two minutes.. keep warm. – 8) Just before eating, add the sev and boil for a minute. – 9) Enjoy with bread or roti. As I said, this is a spicy curry. There is no tomato or tamarind added, There is no sugar or gur, either. To make the taste lighter, you can eat with chopped onion and lime. The masala can be made in advance and stored in air tight container, in refrigerator. Do not add any water, while grinding and it will keep, up to 4 weeks. You can make egg curry also with this masala. Make the basic curry as above, and while still boiling, add eggs, breaking directly in boiling curry. Fresh coriander can be added on top or fried with other spices, as preferred.